Going into The Breakdown, I didn't know too much about the book itself but not long had passed since reading B.A. Paris's debut novel. I was blown away with the first book, and keen to read the second, actively avoiding spoilers and the such like. I went into The Breakdown blind plot wise, but had heard a couple of people say it wasn't as good as the first... And I came away with that exact experience myself. After driving by another car in a lay by on a rainy night, Cass feels terrible the next day when she learns that the driver of the car had been murdered that night. To make the situation even worse, Cass had just been getting to know the murder victim in the weeks prior. This in itself is a big situation, but Cass also has other issues going on, including the possibility of early on set dementia. The book itself follows Cass as the tries to lead her life with a sense of normality, all while struggling with the stress and worry of these circumstances. For the first half of the book, I felt very underwhelmed by the unfolding story, and wasn't able to form a full opinion on all that was going on as it felt like as a reader we weren't privy to everything... And we weren't. 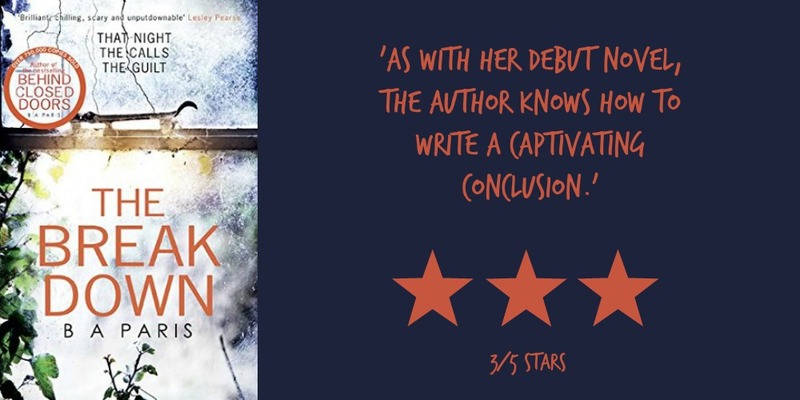 Once I reached the 70% mark, the plot really picked up and I found myself furiously page turning; as with her debut novel, the author knows how to write a captivating conclusion! As with all my reviews, I try to keep them spoiler free, however I will say I did guess a part of the storyline right from the very beginning which kind of disappointed me a little, as it seemed pretty obvious. There were parts of the ending that I didn't see coming, twists at every corner, but also a part or two where I had to suspend my disbelief. Overall I enjoyed my reading experience of The Breakdown. I would recommend this book to others who enjoy thriller reads, and I'll be on the lookout for future works written by B.A. Paris. The blurb on this one caught my attention as soon as it came out so I'm glad to see this review. It sounds pretty creepy and like a good twisty read. That's too bad about the obvious bits but it doesn't sound like it wrecked the reading experience for you. I'm looking forward to reading this one. Great review! I hope you enjoy when you're able to read this title! I just reviewed this one Jade and I need to decide which one I liked better. I think Behind Closed Doors as I thought the intensity was throughout. I also had 2 parts of the story right, one of the people involved and the motive but not the murderer. I will be looking forward to more from BA Paris. Hope you are well Jade. Interesting thoughts, Marce - I agree about the intensity running throughout in Behind Closed Doors. I'm off to check out your review of this title now!